With all the stressful planning of the wedding, a honeymoon retreat was more than necessary. We really wanted the chance to romantically bond together, relax, and have some fun in a beautiful place. 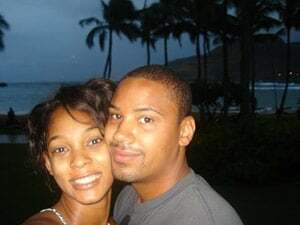 For our honeymoon we chose to go to the beautiful Hawaiian islands of Kauai and Maui from August 9-20, 2008. We initially were planning to go to Tahiti and Bora Bora but Brian's mother bought a timeshare that year and offered to let us use it for our honeymoon. We researched all the areas/cities available through the Marriott Vacations Club, and even considered international destinations. However we ended up selecting Hawaii because of its beauty, the resort and island activities, its proximity to home, and it seemed to offer the perfect balance between romance, relaxation, and activities. I had never been to Hawaii so we decided that if we were going to take a 5.5 hr flight that we should at least visit another island. We decided upon Kauai and Maui based upon suggestions from friends and family who had gone before us. Once we decided upon our destination, I set up a honeymoon registry because with the cost of the wedding laying heavy on us, we needed the help of our friends and family to have an unforgettable honeymoon. I researched flights and when I found a deal on ATA for $700-800 for both of us, I jumped on it with excitement! Unfortunately, a couple months later we received an email from ATA stating they were filing bankruptcy and if we wanted to get our money we had to go through the bankruptcy proceedings and procedures. You can imagine how disheartening this was amongst the rising stress of planning the wedding. What was even worse is I purchased them on a debit bank card and the process of getting my money back took over 3 months! Oh, and it get's better...at the time our tickets became non-existent; the price to fly to Hawaii was almost $700 per person, which we couldn't afford. Changing the dates wasn't an option since it was a booked timeshare. If we didn't go, the trip would be wasted. Luckily, it was brought to my attention that my godfather was a retiree of United Airline and we asked him about the possibility of flying standby. Although scary, we had no other options and chose to fly standby to and from our honeymoon. Our wedding on August 8, 2008 ended at 12 midnight and after cleaning up, collecting items, and counting our honeymoon money we went to sleep at 2am, woke up at 4am, and headed to the airport since the first standby flight left at 8:30am. We weren't familiar with how standby worked so we wanted to make sure to get there early and hopefully increase our chances of getting on the direct flight. (There were other flights available, but they were not direct and had layovers in excess of 5hrs in further cities.) When the gate attendee showed up I decided to let our presence be known for standby and ask some questions. Come to find out, you can't fly First-Class unless you are dressed business casual...are you kidding me? We had 2hrs of sleep and I still have on my wedding makeup and hairdo, the last thing I thought of was to dress business casual, and of course at this point all we had was our carry-ons with our alternative outfits (in our luggage) somewhere in the airport. Man, this stressed us out because we had completely ruined our chances of flying first class, and no one even told us. Luckily, God had mercy on us and the stewardess showed us favor as she had not only managed to get us on the flight, but seated us together in the exit rows!! (We are both over 6ft tall, so the legroom was greatly appreciated.) We were so excited; we thanked her and tipped her $20. Relief set in once we were aboard the plane...next stop Kauai! We arrived in Kauai on a beautiful day and checked into our beautiful suite. It was perfect; we had an ocean view and were right in front of the beach. We must have slept the entire first day in Kauai, not on purpose but we needed it. We didn't waste any time on activities. We decided we wanted to go sports fishing, do a helicopter ride, go on a 7hr tour, spend a couple days discovering the island, and we managed to do it all. The sport fishing was a blast, however a lot different then what we anticipated. Both me and my husband had been deep sea fishing and assumed it would be a similar activity. Not so much. We went out 6 miles on Kauai's waters with another married couple and a 3 man crew. I don't ever get seasick, but I almost did. We were on the roughest, rockiest, highest tousling waves I had ever seen. I thought the ocean was going to swallow our tiny boat all under a sunny beautiful sky. Sports' fishing uses a fishing style called trolling where they let several large lines with bait trail through the sea as we move until a fish takes a bite. It took some time, but we finally got a bite. Each of us took turns sitting in the chair and reeling this mega-fish in, performing the techniques that were taught to us earlier. After 45 minutes of struggling we finally got the fish in...we caught a 110lb Ahi Tuna, only the ships 6th Ahi catch that entire summer. Ahi Tuna is considered Hawaii's gold and can be sold for a lot of money. We had an awesome ship crew who actually cleaned, cut, and divided up the fish for us each to have (10lbs each). Brian barbecued a portion of the fish and we gave the remainder away to our suite housekeeper. The helicopter ride was a first for both of us. I thought I would be scared, but it was actually a very peaceful and calm experience. We loved seeing the beautiful island of Kauai up close and personal. Our 7hr tour consisted of a 2 mile kayak ride (we did the rowing), a hike through a beautiful rain forest, a hayride across famous movie sceneries (Jurassic Park), a zip line across a small river bed, lunch, and a chance to swing into 2 waterfall lagoons. The last waterfall lagoon didn't work out so well for my husband. As he was letting go of the rope on his 2nd drop, the rope swung back and a 6in thick rope knot hit him square in the eye. I didn't know what happened until he got out the water and I asked him why he had a huge knot on his eye. Needless to say, the swelling went away only to be replaced by a purple/black eye which he had for the majority of the honeymoon. The other few days spent in Kauai we decided to drive around different parts and explore, in which we found private beaches and oceans that were enjoyable to snorkel through. We hiked and walked on trails and went to various lookouts, taking pictures along the way. If you didn't know, Kauai doesn't have much of a night life, so our evenings were spent eating and sleeping. However, one night we found a nearby karaoke bar and after a few rounds of singing and a couple of drinks we hit the sack. We had a wonderful time in Kauai and will miss its beauty, but we will not miss the food (thumbs down). Whatever you do, don't have sushi or a hamburger on the island. After 7 days in Kauai, we spent the remaining time in Maui. We used our Starwood points to stay at the Westin resorts in Ka'anapali. The resort and our room were absolutely beautiful! After the bad food in Kauai, our mission was to eat and eat well. We also took this opportunity to relax in Maui since we had done so many activities in Kauai. (You would have thought it was the other way around.) We were so tired that we weren't even interested in exploring the island. (We will have to go back one day to do the infamous Road to Hana.) We ended up staying mainly around the resort and enjoyed the pool, tennis courts, beaches, food and cocktails. We decided to attend a sunset cruise and got to see dolphins swimming by. We also ventured into a local city for some shopping and sightseeing and decided we couldn't leave our honeymoon without a traditional Luau. We loved the luau...the food was great, cocktails were flowing, the company was good, and the entertainment was lively! Despite all of the good times and adventures, there is one occurrence in Maui that we will never forget. Right in front of our hotel was a beautiful beach. We decided to go snorkeling and I advised that we should get fins. However they didn't have any on one side of the hotel to fit Brian, but we figured we should be okay since we weren't venturing too far. Bad idea. As we began snorkeling, we noticed some amazing fish and coral beneath us...not too far from the beach. However, as were getting caught up by the beauty below us, we were venturing farther and farther out, plus we had the help of the current to push us. At one point, I noticed it was getting really deep and I was getting nervous that we were going to run into a larger fish that I may not want to see, so I recommended we start heading back. As I am heading toward the beach, going against the current, I look around for Brian and notice that his feet are making awkward panicky movements. I noticed that his head was above water and decided to stop and check on him. I see him struggling with his snorkeling mask and I ask him what's wrong. He starts saying, "I can't breathe", over and over again. A million thoughts flew through my mind. We are too far out for us to stand or touch the bottom, we have no fins or life vest, how are we going to make it back, what should I do, what is wrong, we could both die, etc. So I immediately go over to him and try to calm him down so that he could start focusing on swimming back to shore. However at this point he is in a panic and there is nothing I can do but grab him around his waist and tell him to kick while I start kicking as hard and fast as possible. My mask starts filling up with water and in his panic he is starting to push me under water and add additional pressure. (Keep in mind, my husband is 6'4" and 245lbs). I am trying to remain calm and not panic, while realizing we can both drown and die. Do I let him go, save myself, and try to get help? Do I drown while trying to save him? Or do I drown with him? I start thinking about my family and friends that I may never be able to see again. I am starting to get tired, hoping I don't catch a leg cramp or anything. Somehow in his panic, he is able to let out a shout of "HELP!! ", "HELP!!" That scene was so surreal, I could see people and kids playing in the water and on the beach, other snorkelers in the water, and it seemed for a moment that we were invisible. Well thank God we weren't, a woman had apparently heard his cries for help and came to our rescue with a boogie board for support. Coincidentally, by the time she reached us, I had just gotten Brian to a point where we could actually stand on the coral. It took him 30 minutes or so to recuperate. When I asked him what happened he said his mask started to fill with water, so he took it off and tried to secure it again. However, it continued to fill with water. Realizing we were far from shore, nowhere he could stand, he panicked, making it hard for him to breathe. He thinks part of the breathing issue could be attributed to a weird raw shellfish he ate earlier on in the day that was given to him to try by a local Hawaiian. After our 10 day honeymoon we headed to the airport to catch our standby flight. To our surprise the tiny airport was packed and even though we arrived early, we were delayed. Unfortunately, a flight to Denver got cancelled so they had to re-route several flights on our particular flight. We spent 10 hours in that airport and were so happy that we were able to finally get on the plane and go home. It is always nice to travel, but it is great to be home. We had the most amazing and memorable times in Hawaii and we are excited that we had the opportunity to go. Even more so, the ability to share our story with you. 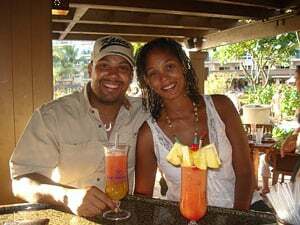 We would definitely recommend for other couples to go to Hawaii, it's a great place for a honeymoon and we hope we can afford to go again in the near future.